From the North: Take 805 south, exit at Balboa Ave. East, go east on Balboa Ave. for 1/2 mile, turn right onto Convoy St., go 1/2 mile, turn right (just before the Burger King) onto Ostrow St., enter the 2nd driveway on your left into the parking lot. OR Take 163 south, exit at Balboa Ave. West, go west on Balboa Ave. for !/2 mile, turn left onto Convoy St. and follow directions above. From the South: Take 805 north, exit at Kearny Villa Rd., turn right onto Kearny Villa Rd., go 1/2 mile, turn left onto Aero Dr., go 1/4 mile. This will end in the office parking lot. 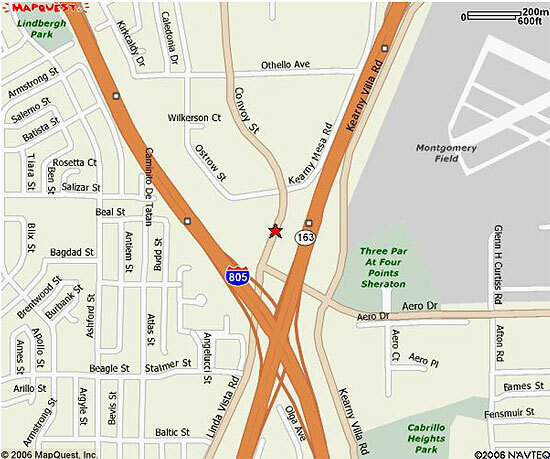 OR Take 163 north, exit at Balboa Ave. West and follow directions above. From the North: Take 5 south, exit at Carlsbad Village Dr., turn left and go east on Carlsbad Village Dr. The office building is on the southeast corner of the first intersection you come to east of I 5 (the corner of Carlsbad Village Dr. and Pio Pico).We are on the top floor at the end of the hallway. 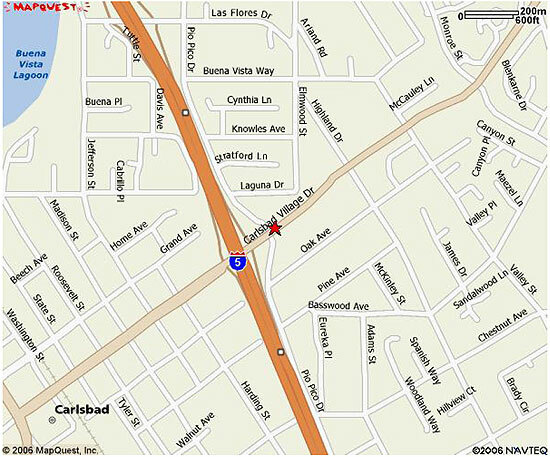 From the South: Take 5 north, exit at Carlsbad Village Dr., turn right and follow the directions above.